We have recently launched development loan bonds on our platform – a new high yielding, property backed debt investment. Read more about investing in property development loan bonds. What are property development loan bonds? Property development loan bonds offer investors the opportunity to lend their money to a property developer and earn interest on the loaned funds. Loans are typically short-term and return a relatively high rate of interest. Traditional bank lending for property development became constrained after the financial crisis of 2008. Since then, an alternative funding market has established, with developers now able to seek finance for their projects from a wide range of specialist lenders with in-house development expertise. Specialist lenders have begun to offer investors the opportunity to deploy capital into loans secured against property development projects, typically paying a higher rate of interest than yields on mainstream investments. Once a suitable loan is in place, bonds are issued to the investors providing security over their capital and paying a fixed rate of interest. Loans are secured with a legal charge against the development project, often with further security provided against a developer’s other assets and/or through a personal guarantee. Interest is usually rolled up and paid along with the repayment of capital at the end of the loan term. In a typical property development finance model, the majority of the capital is provided by a “senior lender”, often a bank. This loan will extend to a loan to value (LTV) of 50%-65% of the expected sale price of the completed project, known as the “Gross Development Value” (GDV). The senior loan will receive a moderate rate of interest in respect of the relatively low level of risk the lender has taken, with the benefit of first legal charge security over the project. In many cases, developers require additional funds beyond the level which the senior lender is prepared to lend, creating the opportunity for a secondary lender to offer a much smaller “mezzanine loan” on top. 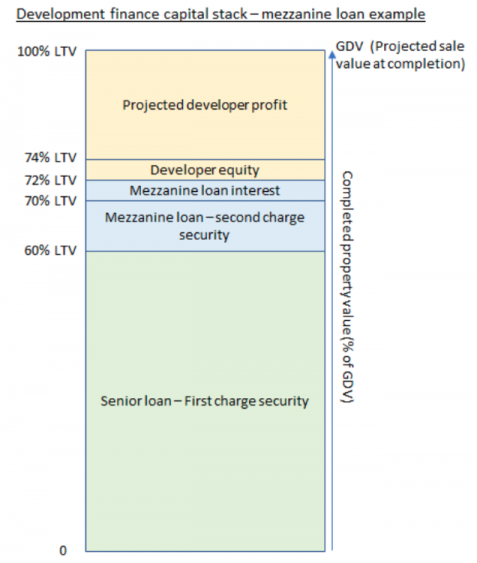 The mezzanine loan will extend to a higher LTV % of the GDV and be secured with second charge security against the project, along with other security and personal guarantees offered by the borrower. The mezzanine lender will typically receive a much higher rate of interest than the senior lender in return for the significantly higher risk profile of their loan. Developers arrange their finance to coincide with the expected completion date of their project and the subsequent planned schedule of property sales. The senior lender is repaid first from the proceeds of the sale(s), with the mezzanine lender receiving their capital and interest thereafter. The developer will only recoup their own equity invested into the scheme and then begin to make a profit, once sufficient proceeds have been raised from the sale of the property(s) to repay both lenders and their interest in full. The diagram below shows a typical funding structure for a property development project, involving a senior lender, a mezzanine lender and the developer. The lenders have different degrees of downside protection in the event that the developer is unable to achieve the projected GDV once the project is completed. In this example, the senior lender will be repaid once just 60% of the GDV has been recouped from property sales, hence a relatively low risk profile for this loan. The Mezzanine lender will be repaid their capital and interest in full once the developer recoups 72% of the GDV, thereby still offering material downside protection, but with a higher level of risk than the senior loan. Read more about investing in property development loan bonds here, and about the key risks associated here.